Face it, there are just not enough hours in the day to complete everything on our holiday “to do” list. Despite our best intentions, there’s always something that gets overlooked. Time is running out, and if you are anything like my wife, she always has trouble trying to come up with gift ideas for me. So, here are ten great gift ideas for the investor in your life. 1. Personal Finance Magazine Subscription. My favorite personal finance and money magazines are Kiplinger’s Personal Finance , Money, Smart Money, Fortune, and Forbs. These are the magazines that I read every month. 2. OneShare Stock Certificates. This holiday season may be the best time to give the gift of a share of stock. Stock is the real gift that keeps on giving. And, OneShare.com provides single shares of stocks in some of the largest companies in America ready to present and hang on the wall with a frame and inscription plate. Stocks like Mattel, Disney , Hasbro, Build-A-Bear Workshop, or McDonald’s make a great gift for children. And, Starbucks, Tiffany’s, Harley Davidson, and many other popular consumer staples also make great gifts for your loved ones. 3. Bull vs. Bear Statue. 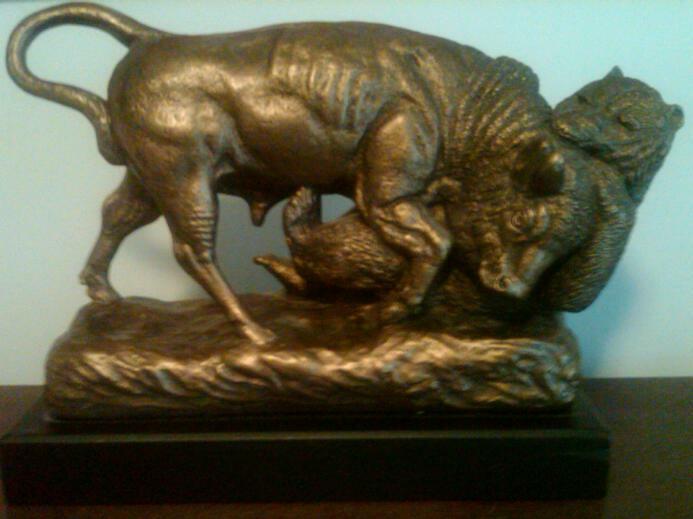 I love statues, and no other statue epitomizes the challenges an investor struggles with day to day and year in and year out than the classic bear and bull fighting. This is a picture of the statue that has sat on my desk since I was a teenager. My mother actually gave it to me for Christmas one year. A statue like this can be the centerpiece of your financial junkie’s office as well. It is a great gift idea! 4. Savings Bonds. You can buy savings bonds directly from the Treasury Department online with the Treasury Direct program. While the interest rate they earn is very small, savings bonds have always remained a favorite gift idea for those hard to shop for finance junkies in your lives. 5. Finance Software. I personally do not use very much financial software. I tend to prefer building my own MS Excel spreadsheets. But, many people love having financial programs to help them track their spending, saving, and financial planning. I have used some in the past though, and I have played around with some of the free online budgeting and personal finance tools such as Wesabe, Mint, and others. There are a lot of great options around, and if you want to give a gift to a loved one in this area, consider giving Quicken Personal Finance Software. Quicken is the top of the line personal finance software from Intuit and has been around for decades. Intuit is the maker of such software powerhouses like Quickbooks for business owners and TurboTax. 6. Personal Finance Books. To say that there are some great personal finance books out there is an understatement. A few of my favorite money and investing books are “The Automatic Millionaire: A Powerful One-Step Plan to Live and Finish Rich” by David Bach, “Total Money Makeover” by Dave Ramsey, and “One Up on Wall Street” by Peter Lynch among many, many others. I only buy my books, textbooks, DVDs, and CDs from Half.com. It’s not only half price stuff, books and movies actually start at 75 cents! I absolutely NEVER pay full price anymore. 7. Money Board Games. You cannot go wrong buying board games. We have gotten away from traditional board games in favor of computer and video games. But, there are some great traditional board games that not only are fun but can teach money and investing to both children and adults. So, don’t forget to check out these games for gift ideas: Monopoly, Game of Life, PayDay, Modern Art, Acquire, Decisions, Classic PIT Corner of the Market Card Game, Easy Money, Money the Board Game, Money Matters, Container (also good for the logistician in your life), and Stock Market For an added touch, you can buy the fancy version, of Monopoly for example, for the financial professional on your shopping list. 8. 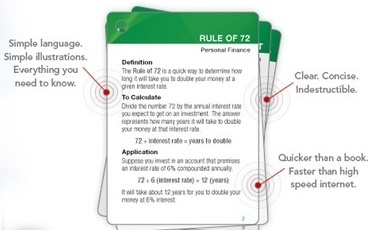 Finance Playing Cards. This is a great stocking stuffer for the financial junkie in your life. You can learn personal finance topics such as retirement, investing, insurance, budgeting, etc. on the flashcards throughout your day. Personal finance that you can take anywhere! You’ve got to love that. 9. Piggy Bank. Now, I am not talking about buying a traditional piggy bank for your loved ones. 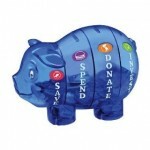 The Money Savvy Piggy Bank helps to teach kids how to save for a variety of different goals all at once. The Money Savvy Pig piggy bank has four chambers, one for each of the four money management choices a child should be taught from the time they are small. The four chambered slots of the piggy bank are save, spend, donate, and invest. This is a great teaching tool for children and adults alike. 10. Money Ties, Tie Tacks, & Gifts. Like I have said, time and time again, I am a personal finance, money, and investing junkie. I love anything that has to do with personal finance. I have ties, tie tacks, money clips, and other gifts with a stock, investing, or other theme. My wife hates that I am a knick-nack lover. I have so many things displayed on my desk, and of course most of them are money related. I have a small model of a 1920’s stock ticker with ticker tape for example. So, consider these little things for your loved ones. Book ends are another great gift idea. You can find a ton of them in a money or investing theme. Old stock certificates!! Did you know that there is an actual name for collecting stock certificates? Scripophily! I love having framed stock certificates up on the wall of my office. I have bought old canceled shares of some famous companies too…even companies that do not exist anymore. Those ones are the best like Enron, WorldCom, Wendy’s International, Indian Motorcycle, etc. Subscription to such classic money and investing newspapers such as Investors Business Daily and the Wall Street Journal. Subscribe to Investor’s Business Daily Digital Edition – Get 4 Bonus Weeks! Grandparents should consider contributing to their grandchildren’s 529 College Savings Plan. For stocking stuffers – Consider a Money Maze Bank Puzzle , money movies such as “Wall Street” or “Broiler Room”, etc. A membership in investing groups like BetterInvesting or AAII are a great resource as well. These non-profit organizations offer journals and other educational and support material for the do-it-yourself investor. In addition to the books you recommend my book “Simply Fantastic: Living Better On Less.” It would be a great book suggestion for number “6. Personal Finance Book.” It is not a heavy duty financial book, it is easy to read and you can open the book to any page and find interesting and valuable money saving ideas. Brimming with optimism and humor, Simply Fantastic is a valuable guide to financial responsibility for all ages. Good article with some great suggestions. I have made mention of your site on my Twitter and website.